GREENVILLE—On May 31, the Greenville Township Fire Company, Inc. was dissolved by a resolution of the Fire District Board of Commissioners, and a new fire company called Mountain View Fire and Rescue, Inc. was designated the exclusive fire company for the district. The announcement came after years of conflict between the Greenville Fire Company, which owns the firehouse on Route 6, and the Board of Commissioners, which rented the firehouse from them. The lease expired Dec. 31, and because the two groups could not agree on a new lease, the Board of Commissioners decided to build a new firehouse on property adjacent to the Greenville Volunteer Ambulance Corp, which they have leased for 99 years at $1 a year. The Greenville Fire Company sued the Board of Commissioners saying they did not follow proper protocol with their State Environmental Quality Review (SEQR), among other things, and the building, now over half built, sits vacant while the legal case is being resolved. The Board of Commissioners said the decision had nothing to do with the fire house and was based purely on staffing issues. For example, the Greenville Fire Department did not have a certified chief. Darryl Davis, who was elected by the company to be the chief, was given one year by the Board of Commissioners to get all his certifications for the position. He completed all the necessary coursework, he said, but had to take more classes because the requirements were raised at the end of this year. 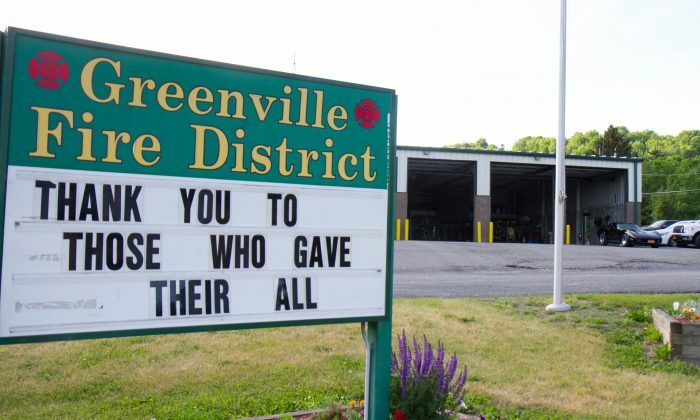 On May 31, the district removed its fire trucks from the firehouse “without warning,” said Jim Decker, a member of the Greenville Fire Department. “We went to the firehouse the other day—no trucks, they’re gone. [They] never told us, they just took them out of the building,” he said. The spokesperson for the Board of Commissioners, Danielle Buchheit, said the district assistant chief told the Greenville Fire Company’s Lieutenant Vice President, Larry Buckley the day before. The four trucks were moved to a fenced-in area outside the unfinished fire house, and Buchheit said they will remain there till the new fire house is completed. She did not have an estimate as to how long that would be because they are waiting on a resolution of the lawsuit. The Greenville Fire Company sued the Board of Commissioners saying they did not follow proper protocol. During the meeting where the Board of Commissioners made the announcement about the dissolution of the Greenville Fire Company, a company that has been in operation since 1945, a Greenville resident, who declined to be identified except that she lived in district four, drilled the commissioners on who would be coming to her house in the event of a fire. “They’re [the trucks] locked up, how is that going to cover my house?” she asked in a raised voice. The commissioners assured her there was a fire company to cover her house, but did not specify which. This concern was reiterated at the June 2 Greenville Town Board meeting by several more residents. Because the Town Board has no jurisdiction over the Fire District, they told the residents to take their concerns to the attorney general’s office or the comptroller. During public comment, Buckley suggested getting a petition together to disband the Board of Commissioners, which the town’s legal council, David Bavoso, clarified meant dissolving the Fire District. According to the Board of Commissioners, Mountain View was formalized last summer and has been training on the Fire District apparatus since January. Also in January, the commissioners appointed Mountain View as one of the designated fire companies to operate within the town. Buchheit said when she looked at the roster around June 2, there were 28 members, but thought a few more had been added since then. She said all the members were certified to do their respective jobs, except for some of the “younger members” who were still in training. Mountain View’s Chief is John Bell, and the Assistant Chief is Jack Cavender. They answered their first call, a structure fire in Greenville, on June 6. The Town Board responded they never endorsed the new fire company. Town Supervisor George Hossan, Jr. said he would call the commissioners after the meeting to find out what was going on, adding he had offered last June to be a go-between for the two groups to avoid getting attorneys involved, but was told they weren’t interested. Buchkkeit said she was not aware of that offer. Greenville Fire Company President Bob Harford said he expressed his willingness to have Hossan mediate, but did not think it would not lead anywhere. On June 6, the message board in front of the Greenville Town Hall said, “TOWN BOARD DID NOT ENDORSE NEW FIRE CO.” The message was removed the same day. “I think it was a misunderstanding between Mr. Hossan and the commissioners,” Buccheit said. Hossan could not be reached for comment by press time. After the Town Board meeting, Buckley said he hoped to continue negotiating a lease for the company’s fire house, and said they would even be willing to sell it, one of the sticking points in the previous lease negotiations. He said if Greenville does not have a use for it, they would either have to sell it or find another company to lease it to. Buchheit said she wouldn’t rule out further negotiations, but since they were over half way done building the roughly $200,000 fire station, it would be hard to imagine a lease agreement that would entice them to go back.